Have a Speeding Ticket in Edmonton? We Are Here to Help! Speeding is probably the most common charge related to traffic offences. Every road has a set speed limit, whether posted or not. It is your duty as a driver to obey all posted speed limits, as well as understand the regulations regarding types of roads and automatic limits. By driving over the speed limit, you are risking being charged with speeding, and you are putting yourself and others in danger. Speed limits are enforced for your own safety, and the safety of other motorists and pedestrians. The fines for speeding range from $57 - $351 depending on your rate of travel. Speeding through a set construction zone will result in an immediate doubling of the normal fine. Every conviction for speeding will stay on your record for a period of 3 years. If you've recently received a speeding ticket in Edmonton, you are not alone. 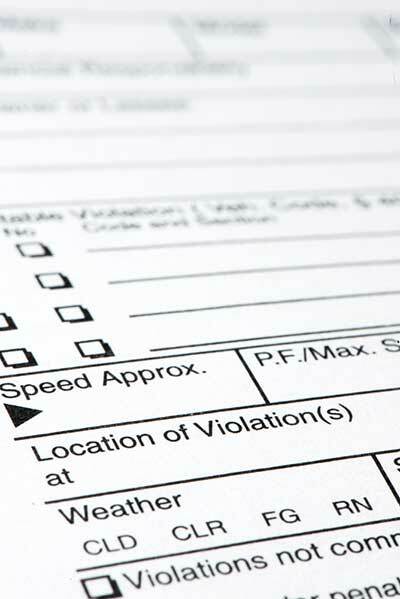 Speeding tickets are among the most common types of traffic tickets. Every road has a speed limit that is enforced for the safety of yourself and others. Driving over the speed limit puts you at risk of numerous penalties. At Got a Ticket Fight It, we provide important information and representation for drivers who have been charged with speeding. Here is what you need to know about how a speeding ticket in Edmonton can affect you. Speeding tickets (that are below 50km over, the ones that are yellow) the fine ranges from $78 to $474. Speeding tickets over 50 km are always pink with mandatory court appearance (if they don’t appear in court they may issue a warrant for their arrest) these tickets could carry 6 demerits, a possible licence suspension and fines could be as high as $2,300. 2 demerits for exceeding the speed limit up to a maximum of 15 km/h. 3 demerits for exceeding the speed limit by 16 to 30 km/h. 4 demerits for exceeding the speed limit by 31 to 50 km/h. 6 demerits for exceeding the speed limit by 51 km/h or more. A conviction for a speeding ticket in Edmonton will remain on your driving record for three years. If you accumulate enough demerits, you will also have your licence suspended. Drivers with a class 5 are only allowed 14 points (they get a suspension at 15 points) and drivers with a GDL are only allowed 7 (they get suspended at 8). If a person with a GDL licence gets suspended due to demerits then they can’t apply for a class 5 licence for another year. Exceeding the speed limit by more than 51 km/h can result in a possible licence suspension as well, even if you haven't reached the demerit point limit for your licence class. Receiving one or more speeding tickets in Edmonton can cause your car insurance rates to go up, though how much they will increase and how many tickets are needed to prompt an increase will depend on your insurance company. Some insurance companies won't hike your rates for one ticket, especially if you weren't going too far above the speed limit. However, getting convicted for numerous speeding tickets, especially at higher speeds, will cause you to be seen as a greater insurance risk and can quickly prompt an insurance premium increase. Keep your insurance rates low by driving safely and by taking the right steps when you do get a ticket. By paying the fine for a speeding ticket in Edmonton, you are automatically pleading guilty and tarnishing your driving record. Your best course of action is to seek experienced advice and representation from the paralegals at Got a Ticket Fight It. Our talented and dedicated team will fight to protect your interests and ensure the best results for your case. If you have received a speeding ticket in Edmonton, then you can request a free ticket defence quote using our online form. For any other questions, don't hesitate to contact Got a Ticket Fight It today. First, contact Got a Ticket Fight It – we have successfully represented numerous clients who have been charged with speeding. We have the experience and the knowledge to get the best results for you. Contact us, request a free quote, or call today for your free consultation at 780 428 1000.